We left off Part 2 of my "Best Dishes of 2017" (you can see Part 1 here too) in San Francisco. We stay in the Bay Area for Part 3 here, with a trip up to Healdsburg, then detour to Las Vegas, swing back to the east coast for a quick trip to Boston, then back home before ending the year in Santa Fe, New Mexico. 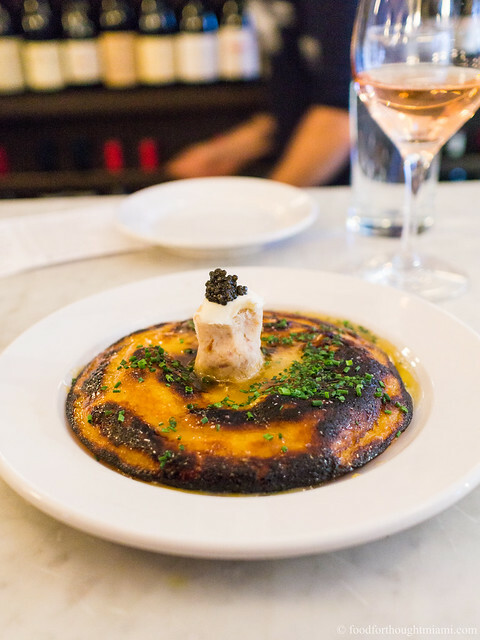 As always, the "best" here is meaningless – this is just a compilation of some personal favorites from among several great meals over the course of the year. Our summer getaway found us on the West Coast, a trip which included a couple days in Healdsburg. The wine country in the northern reaches of Sonoma County is among my favorite places on earth, and now it has a restaurant to match the beauty and bounty of the area: Kyle Connaughton's SingleThread (see more pictures in this SingleThread Farm flickr set). SingleThread is about as fully realized a vision of the Japanese combination of kaiseki dining and ryokan as you'll find outside of Japan: a restaurant, supplied by its own nearby five-acre farm (run by spouse Katina Connaughton) plus contributions from neighboring farmers, fishermen and foragers, with a small, luxurious inn on premises (we regretfully didn’t stay at the inn, instead renting a house up the Russian River so we had room for the whole family and some friends). This was, from start to finish, just a magical meal – refined and beautiful and flavorful, intimately expressive of season and place. After a glass of bubbly and a platter of snacks on the rooftop garden terrace, we were brought back inside to the dining room and greeted with a spread that could do double duty as a centerpiece. 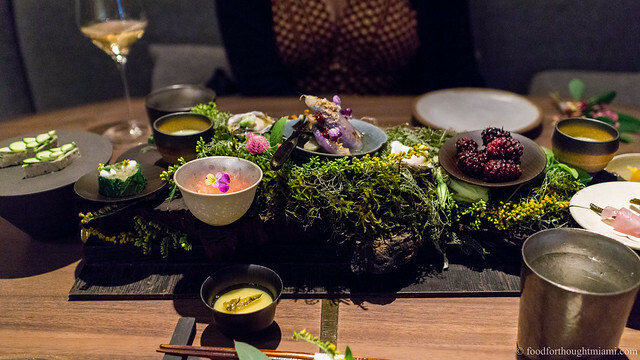 There’s maybe a dozen different items laid out across the table, interspersed among an arrangement of branches and blooms. 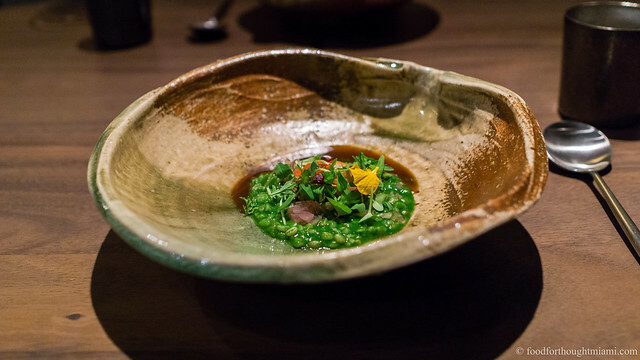 I won’t try to recount everything here, and in any event the contents vary from day to day and season to season like the "hassun" course of a kaiseki meal, but I particularly recall the cold slivers of geoduck in a neon peach-hued stone fruit gelee; a tart, bright, green tomato gazpacho; a creamy corn panna cotta with an accent mark of fermented cucumber; silky purple baby eggplant agebitashi with a sesame and plum curd; an intensely rich mousse of potato and salt cod; ripe, fat mulberries from nearby Middlteton Farm. And it's all as delicious as it is beautiful. 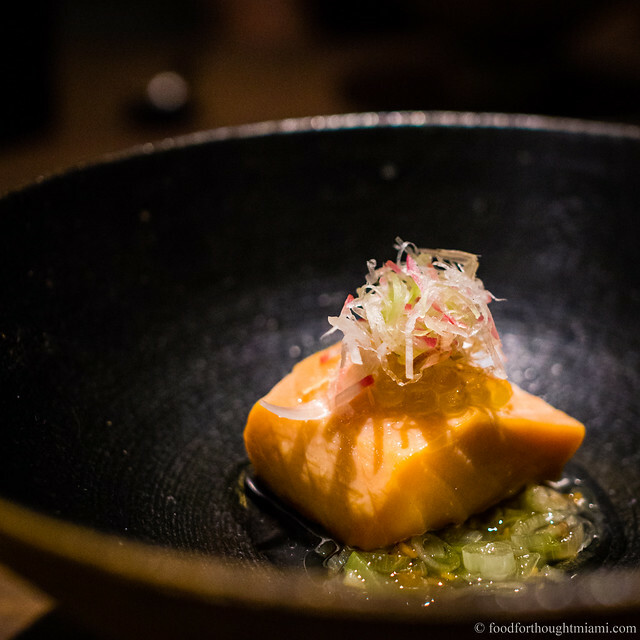 From an ornate tapestry of dishes to bare-bones simplicity: wild king salmon, caught in Half Moon Bay, smoked in an ibushi-gin (a type of donabe, or Japanese stone pot, which are something of an obsession at SingleThread), swimming in a vinaigrette of negi (Japanese scallion) bolstered with the magic of shio koji, garnished with a dollop of char roe and a tiara of finely slivered myoga (young ginger) and radish. When I had the smoked salmon at Willows Inn, I was pretty certain that would be the best salmon I'd ever eat in my life. Now I'm not so sure. So often, foie gras gets fruity accompaniments as a foil for its richness. Here, instead, Connaughton goes vegetal. A disk of poached foie, with a texture like cool butter, is awash in a "tea" of last year's tomatoes, plus an assortment of radishes and their greens in various forms: fresh, preserved, dried. The peppery crunch of the radishes does the same job without the usual cloying sweetness. And then another bit of magic comes from an aged sake poured with it – again, a far cry from the customary sweet Sauternes – which magically pulls it all together, one of the most memorable pairings of the whole year. I know, we're four deep into this list and we're still haven't left SingleThread. What can I say, it was pretty good. This bowl of Sonoma grains, bound in a luminous green nettle purée, garnished with kasuzuke pickled vegetables, a farro verde beignet, a bouquet of herbs, sprouts and petals from the garden, and a tableside drizzle of an intense aged rib cap jus (presumably a byproduct of the American wagyu served in the prior course), was served as the final savory item on the menu, in the same fashion that a rice dish usually acts as the anchor of a Japanese meal. It was incredibly gratifying and delicious, and felt like something of a summary and recapitulation of all that preceded it. In October, a conference brought me to Las Vegas, where I always find time to visit Aburiya Raku (read my thoughts and see more pictures in this Aburiya Raku flickr set). It's the first place I tried fresh, house-made tofu and it's still one of my favorite places to order it. 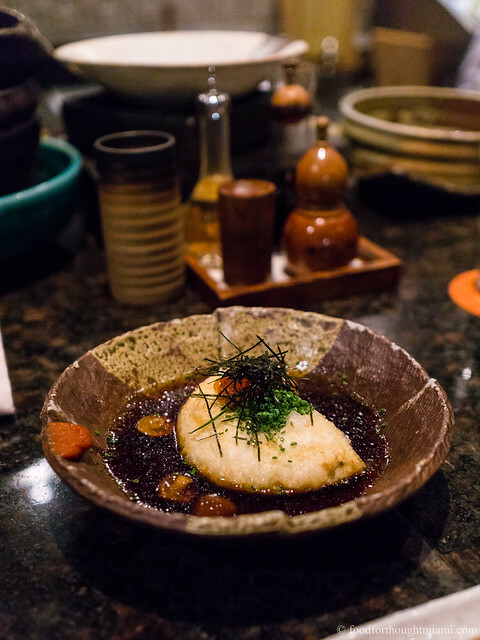 The pro move is to go half-and-half: a half order of the "Raku's tofu," served cold with garnishes of katsuobushi, chopped chives, minced ginger, and green tea salt; and a half-order of the agedashi tofu, fried, doused in an enriched dashi broth bobbing with little mushrooms, and topped with a dollop of ikura, shredded nori and more chopped chives. It's so good. I've already sung José Andrés' praises once before here in Part 1, both for his work in and out of the restaurant world over the past year. As for the former, some of his most interesting work is done at é, a tasting menu restaurant-within-a-restaurant inside his Las Vegas Jaleo, done in the style of the original minibar (read my thoughts and see more pictures in this é by José Andrés flickr set). 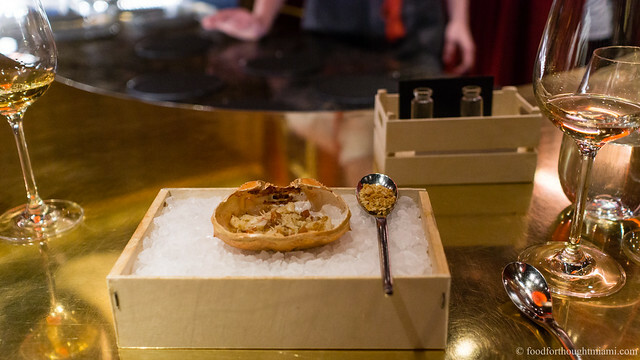 Another contender for dish of the night: dungeness crab, the meat picked and placed back in the carapace, anointed right before eating with a vial of warm crab juices and a spoonful of crisp bread crumbs. Where the asparagus dish succeeded with a multiplicity of elements, this one succeeded through simplicity – just delicious, warm, sweet, salty crab. 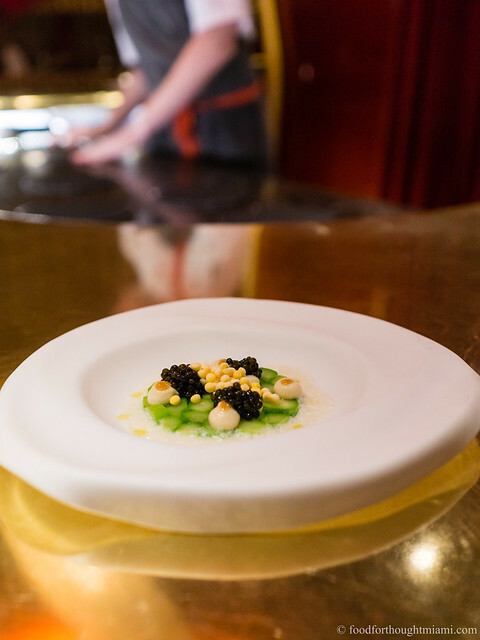 A brief business trip to Boston was as good an excuse as any for some good eating, including a visit to Barbara Lynch's flagship, No. 9 Park (see more pictures in this No. 9 Park flickr set). As a solo diner, I particularly appreciated that the restaurant's bar was set up to offer anything from bar bites to the full tasting menu, and anything in between, which was the path I chose. 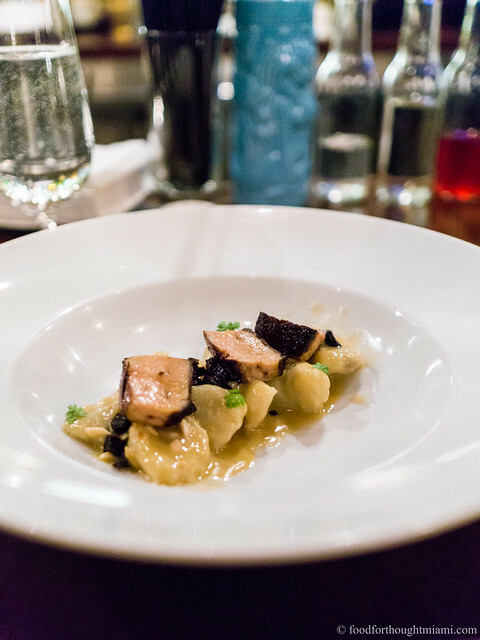 What had drawn my attention in the first place was a dish of prune stuffed gnocchi,with foie gras, almonds, and vin santo. I only learned after the fact that this was a Lynch signature dish, one of those things she's been serving the better part of two decades and can't take off the menu. And I can see why. So rich. So good. I know just a few paragraphs ago I was dissing the old foie gras / fruit / sweet wine trope. But sometimes, still, it works. Speaking of signature dishes: I love pretty much everything about Boston's Neptune Oyster Bar (more pictures in this Neptune Oyster Bar flickr set) – the impeccably fresh, broad selection of shellfish, the excellent lobster roll – but I especially love their signature dish, a fluffy burnished johnnycake, drenched in an immodest quantity of honey butter, topped with a mound of smoked fish pâté and a dollop of sturgeon caviar. 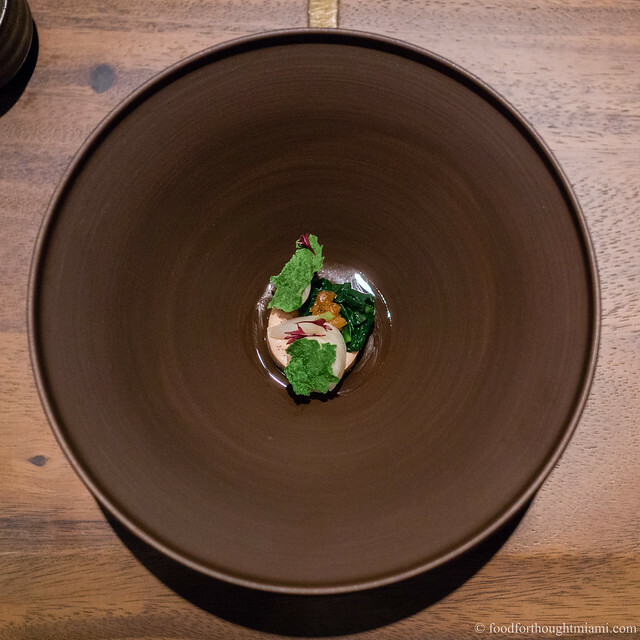 After a long time coming, we finally nailed down a Cobaya dinner at Ariete, Michael Beltran's Coconut Grove restaurant (read my thoughts and see more pictures in this Cobaya Ariete flickr set). 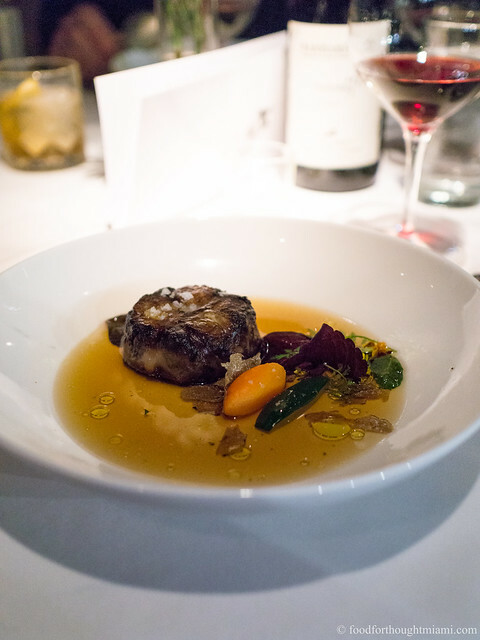 I was so glad it finally came together; I think Mike is one of Miami's most promising young chefs: he's got ideas, he's got chops, he's got drive, and it's starting to come together really nicely at Ariete, which just celebrated its second birthday. Sometimes he'll fuse French and Latin flavors, like when yuca con mojo meets leeks in vinaigrette. Sometimes he'll go full old school, like this boeuf bourguignon with beef tongue and veal heart. And sometimes he'll just make something flat out delicious, like these fish sauce caramel wings or his frita cubana. We finished the year with a quick trip to Santa Fe, New Mexico, where in three days I ate my weight in chiles. While I enjoyed the local New Mexican cuisine, my favorite meal there was at a South Indian restaurant, Paper Dosa (read my thoughts and see more pictures in this Paper Dosa flickr set). 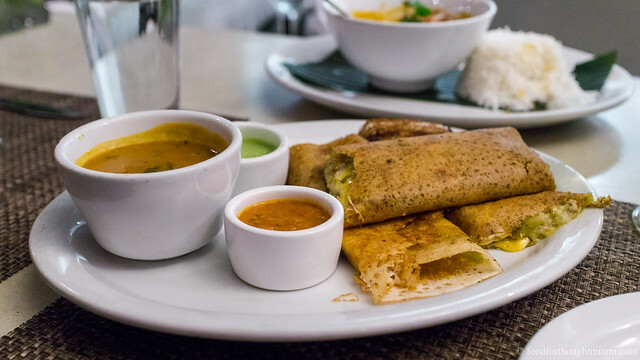 Everything at Paper Dosa was eye-poppingly good, but the standout was a dish that sort of came full circle: a delicate dosa (a crepe made of fermented rice and lentil batter) stuffed with local green chiles and melted cheese, served with traditional accompaniments of sambar (a sort of lentil stew), plus coconut and tomato chutneys. This wasn't one of those goofy "fusion" dishes, like where some French or Italian dish gets some incongruous Asian ingredient thrown into it. 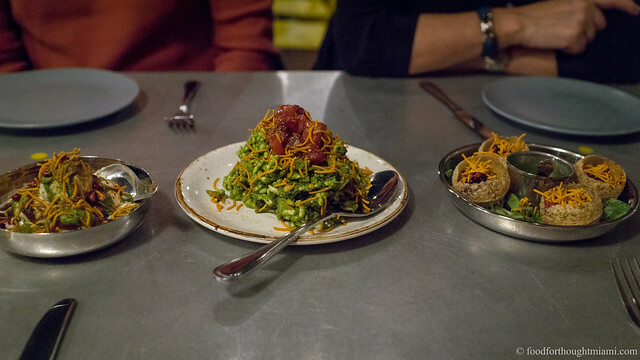 It tasted entirely South Indian, and entirely New Mexican, all at once. Looking back on this list, some patterns emerge, but it's hard to tell if they're meaningful or just like the white noise that used to come on the television when the station went off the air. One thing I see is how few Miami dishes are on this particular list, and that most of them are from one-off dinners. Usually anywhere between a third and half the dishes on this list are locally grown; this year, it's less than a quarter. Some of that could certainly be on me; I've already said that 2017 was the year of the "to-do" list for me, and maybe greatness awaits in those places I've not yet tried or gotten to know sufficiently well. I aim to find out over the next year. Another thing I see is a swing towards simplicity. Rather than a dozen things on a plate, give me a few great ones, prepared precisely and combined thoughtfully, and I can be very happy. Some of the best things on this list are two- or three-note wonders – brains in vinaigrette, uni and chickpea hozon, carrots, clams and sunflowers, shrimp and shiso leaf. As always, I'm incredibly grateful for all the people who make it possible for me to eat so well. To all the chefs, cooks, waitstaff, sommeliers, bartenders, busboys and dishwashers, all of the farmers and fishermen and forargers, all of the winemakers, brewers and distillers, all the guinea pigs at our Cobaya dinners, and all the wonderful people I've had the good fortune to share meals with, both in person and vicariously: thank you. As my grandfather used to wish us each year: always better, never worse.